Here you'll get Bahria University Karachi Jobs 2019 Career Opportunities announced for the well educated and skilled individuals who are welcome to apply for the announced positions. 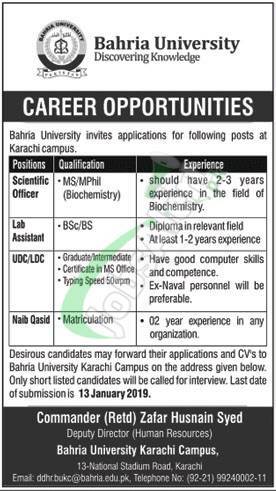 Candidates from Karachi are welcome to apply for Jobs in Bahria University Karachi which are (Scientific Officer, Lab Assistant, UDC/LDC, Naib Qasid). Candidates possessing qualification from Masters to Matric and relevant field experience are welcome to apply on or before the last date 13th January 2019.